You may have noticed that images play an important role in digital marketing. 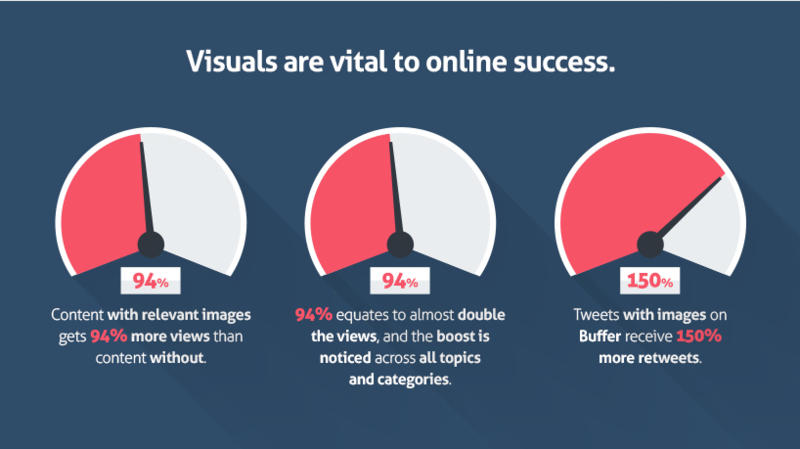 But are you also aware of the reasons why images in your marketing strategy are so important? Are you convinced enough of the benefits of images to make the extra effort and assure that all your content includes (enough) images? And even if you are aware of the importance of images, are you sure you know which type of images you should use with your content? The truth is: not just every image does the trick. When we get asked whether we accept guest posts (if you are interested: we do accept guest posts, but only if they meet our requirements), I always make clear that we want some images to publish with the post. And I am not talking about stock photos. Because stock photos and free images may look nice on the surface and maybe even help to structure the post. But free stock photos don’t add value to an article. They never give additional information, most of the time the image in the stock photo is only vaguely related to the topic of the post. So what am I talking about? What are great images for your content strategy? Quotes: If you have someone famous or an expert talking about your topic and agreeing with your point: Make an image with a quote on it. Memes: Why not let your audience smile while consuming your content. A Meme can well be what people will remember. Social media images for the social networks that you are using: Pinterest, Facebook, Twitter – make sure you provide images with the right dimensions – and don’t forget the text overlay for Pinterest. These are just to give you an idea. For each post and story that you tell, there are great ways to include valuable images into the content. You will have to learn, watch your analytics and listen to your audience to figure which types of images resonate best with your audience. I already hinted at the fact, that images help you to structure the content – but there is more to it. 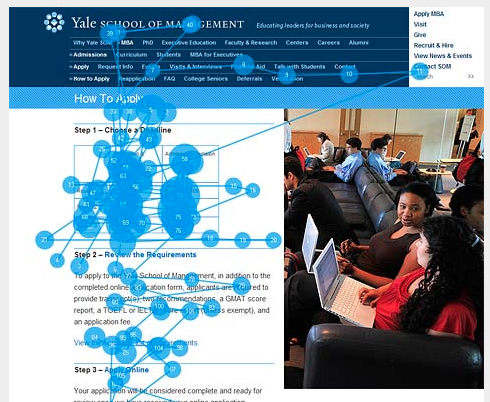 Eye-tracking software proves that internet users pay closer attention to information in images. Images provide valuable fixpoints in the content. And if they are related to the actual topic and content they help your audience to skim the content and see in an instant whether the information is useful – or not. But! You need to provide images that are valuable to your audience – simple, unrelated stock photos will most of the time not do the trick. Instead go for graphics, illustrations or something else that is on-topic. Do you want to make an impression on your audience and stay on their minds? Use images! If we hear a piece of information we will remember 10% of it after 3 days – if you see the information, you will remember 65% of it. 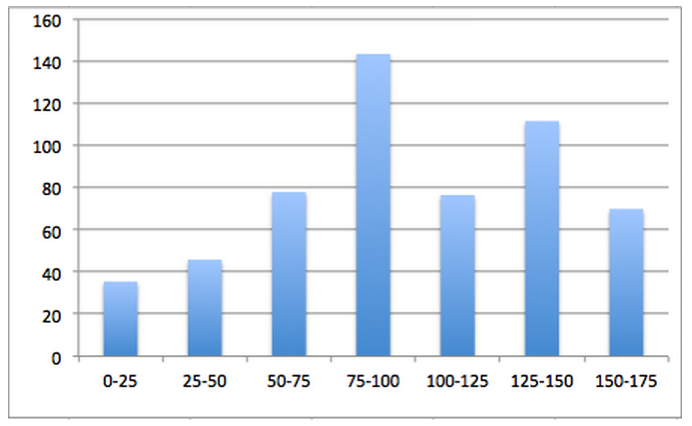 And statistics are similar for written content compared to images. There are several reasons why a piece of content without any images does not get as many social shares as content with images. It all starts with the „need“ for images in some social networks which means that images make your content more shareable. But there is more to images for social media platforms. 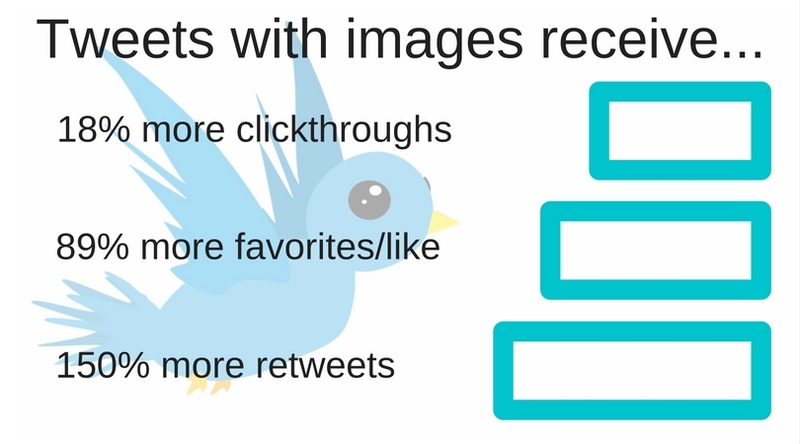 Tweets with images get 150% percent more retweets and a lot more engagement than tweets without images. And people like me know that. I will not tweet your content if you don’t provide any image to go with the tweet because I know that it is more or less worthless to tweet content without an image. 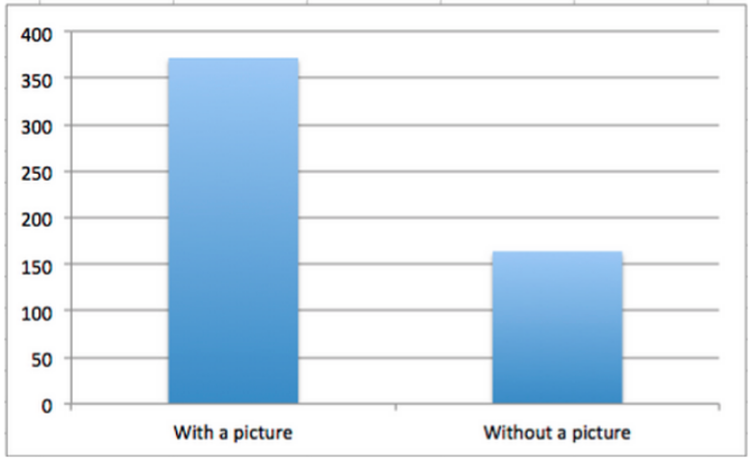 The same applies for Facebook: Posts with images get 2.3 times as much engagement than posts without images. BuzzSumo also analyzed over 1 million articles and found that articles with images every 75-100 words get double the social shares. And we haven’t even been talking about some special types of images like Infographics, which are “liked” and shared on social media 3 times as often than any other type of content. Social media marketing without images is near to impossible in today’s world. And the same applies to a content marketing strategy. And it does not end with the social shares. Your articles will get a ton more attention if you include images. Of course, some of this is due to getting more social shares – but here it is in numbers: Articles with images get 94% more views! Since Google provides an image search, you can also earn organic traffic to your website if you optimize your images for search. Let us be honest: Digital marketing is not all about blogging, creating posts, engaging and getting it shared. In the end, we all want to sell something online. And images can help you to make the sales! Consumers love images. Images create trust and give a look and feel of the product they are about to buy. 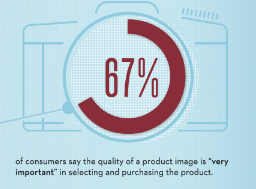 In fact, 67% of consumers claim that the quality of a product image is very important for them in the process of selecting and purchasing a product. Have you ever noticed, that some graphics are used in almost all content on a given topic? Usually, these graphics are some statistics, quotes or illustrations that work very well. And the creator of these images gets a backlink as the image source every time the image is used. That is an awesome link building strategy. But it only works if you create unique and engaging images. Nobody is going to “quote” your royalty free image that you downloaded from a collection of stock images. Yes, creating images for online content may take some time. But there are some great tools that you can use that makes it possible for you to create beautiful images for all sorts of purposes for free – even if you are not a designer. I am using Canva for most of my images. When you create your own images for your marketing campaign, make sure you use branding on the images to make them recognizable. And it is not only worth the time you need to create the images. In reality, not adding images to your content will kill a lot of the digital marketing success that you could have with your content if you had more valuable images in your content. When I am asked to look at a blog and give advice on how to optimize it, one of the most common marketing tips is to add some images and structure to make the post more engaging. In some business areas images are even more important. For instance, internet marketing for ecommerce in today’s world is near to impossible. 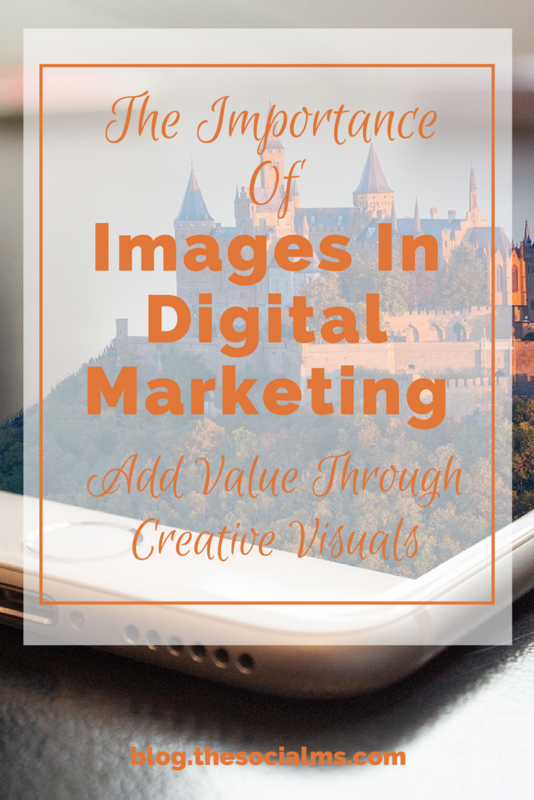 Images are no longer an add-on – they are a must for any type of digital marketing content! 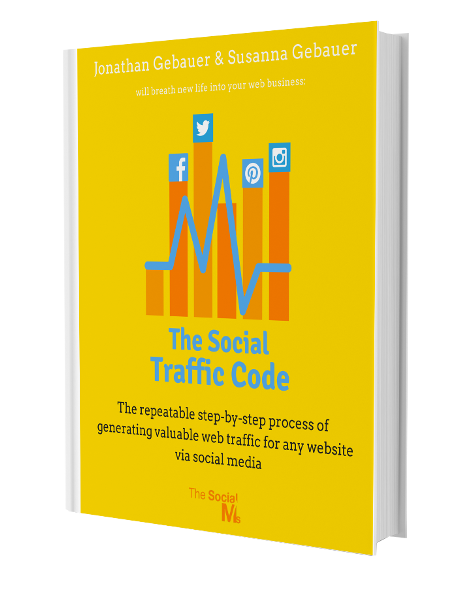 Are you looking for (free) traffic from social media?